Is Christine Bronstein The Most Powerful Woman In Politics? Teen Vogue, November 19, 2012. 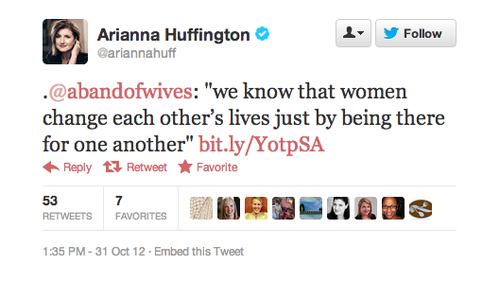 Huffington Post founder Ariana Huffington tweeted support of and a link to Nothing But The Truth, So Help Me God to her 1,070,198 followers on October 31, 2012. Gabrielle Bernstein Gabbyb.tv, October 31, 2012. Lissa Rankin, Owning Pink, Care 2, Blogher,Psychology Today, and Positively Positive, October 30, 2012. Face it, folks. In too many lives, it’s the first thing to go –; not dropped, mind you, just shoved to the side. And, most often, it’s the one thing you utterly, truly, essentially need. We’re talking friends. True friends. Through-thick-and-thin friends. The International Women’s Media Foundation today announced that Alexandra C. Trower, executive vice president, global communications of The Esteé Lauder Companies Inc.; Phil Bronstein, editor-at-large for Hearst Newspapers, and Christine Bronstein, founder of A Band of Wives, a social networking Internet site, have been named co-chairs of the IWMF’s 20th Anniversary Steering Committee. Most of us who live anywhere east of San Francisco tend to associate the city with hippies and earthquakes. It is glorified by some as being the Mecca of open-mindedness and vilified by others as being the roiling hell of all that’s wrong with the world. And well, both sides think of earthquakes. However you see it though, there is no denying that there is definitely some quaking and social movement going on with San Francisco women. They’re on the march, but this isn’t your Mama’s feminism.